Hierarchical organization structure is a top-down pyramid system used to organize and arrange the relationships between the entities in an organization. Responsibilities and rights are concentrated on the top of the pyramid and decisions flow from the top down. The pyramid can be steeper. Steep pyramid has many levels of management, so a unit of organization is relatively small. In contrast, for the organizational form of the relationship among a system, the direction of activity is not fixed a (top-down), but flow back and forth between the entities are involved. In other words, the activities of the parties concerned must agree with each other's direction. 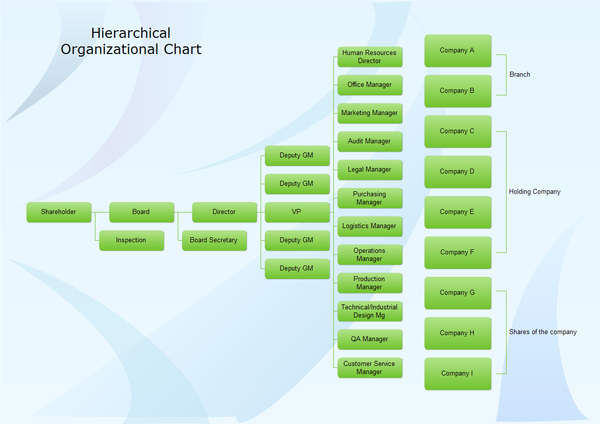 This following image represents the hierarchical organization chart for a producing enterprise. This chart also this organization's branch companies and holding companies. They are presented in one line, separated with a bracket shape. When you need to use a bracket, open in the Callout category from the General group. More styles of such shapes are available, including brace and parenthesis. With Edraw Organizational Chart, you can create clear and comprehensive enterprise organizational charts even with no prior experience.